As of March 17, 2017 we will have Gathered our COM together 104 times, shared in the knowledge and experience of 26 Mug Club’rs, and published 94 regular issues of our Newsletter. Because our newsletter was started later than The Pub Club itself, we will be publishing our 100th issue of “Keeping Up With The Hub” on April 25th, 2017, and both “Centennials” will be highlighted in that issue. 9/5/14 – Brad Day shared his recent participation on a USDA research grant panel. Students & post docs learned how the process on this particular panel worked as well as what types of research were primarily funded. 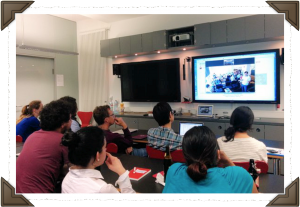 Our March 10th, 2017 Gathering hosted our 26th Mug Club’r, Dr. Doug Schemske, over an Aquos Board using our Zoom interactive conference system and the summary was slightly larger with 359 words. This is just one example of how far we have come in the last nearly 3 years! 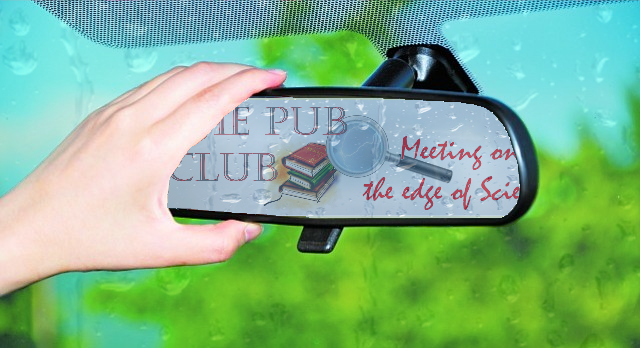 In preparation of our Centennial celebration, I thought it would be worth a few minutes to take a look back at the road The Pub Club has traveled in between to see how well our Mission objectives of 1) Meeting on the Edge of Science and 2) Filling the Void are being fulfilled. Our first semester we hosted four guest discussion leaders, which we affectionately call The Mug Club. Dr. John Froehlich was the first, followed by Dr. Robert Abramovich, Dr. Beronda Montgomery and Dr. Shin-Han Shiu. 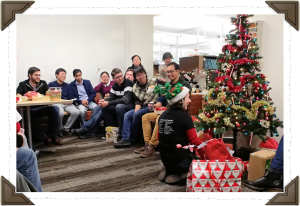 On December 12, 2014, TPC held our first PI Q&A Day with our other two supporting PIs, Dr. Sheng Yang He and Dr. Gregg Howe. 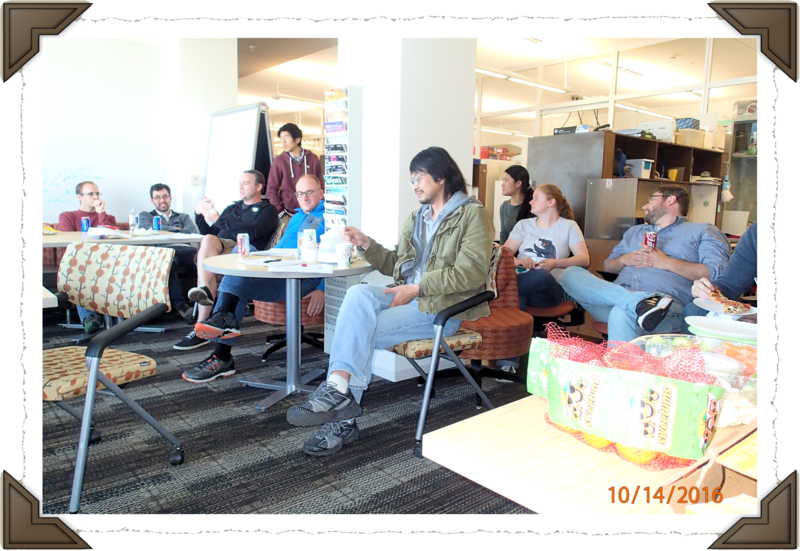 It was a rousing success, one which we repeat every semester. 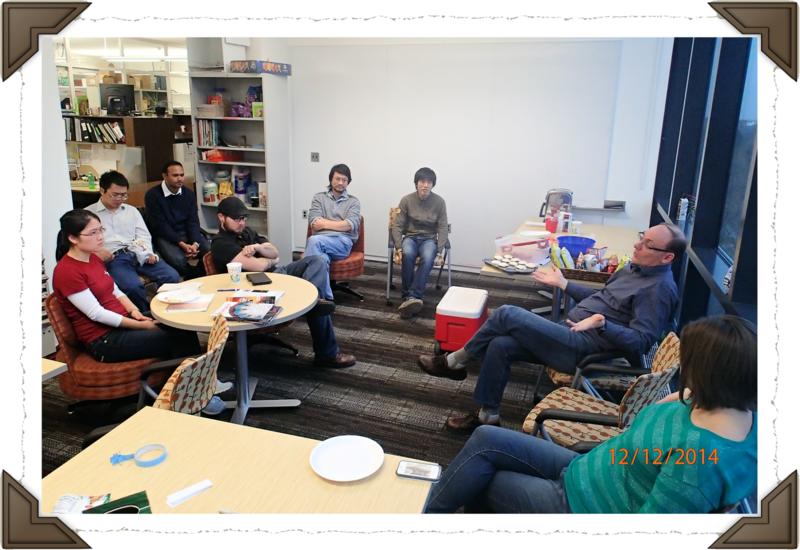 In fact, the PI Q&A day has gotten together with the guest speaker program of The Mug Club and spawned The Coaster Club. 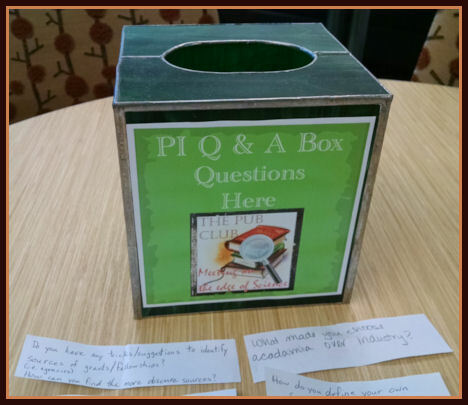 The Coaster Club is a typical PI Q&A where questions are drawn from the infamous GREEN glass question box but are asked to a panel of supporting PIs and guests. TPC’s second Coaster Club Q&A day is only a few short days away on March 24th and promises to be just as big a hit as the first. Inspired by a discussion with Mug Club’r Shin-Han Shiu, TPC began a “Sub-Club” in January 2015 called The Python Group, a computational group focusing on basic Python and R. In March 2015, The Pub Club started our own LinkedIn Group, which quickly had about a dozen members, but, perhaps more importantly, revealed the lack of Digital Awareness within our membership. As a result, the research for “The Edge” on Digital Identities began. 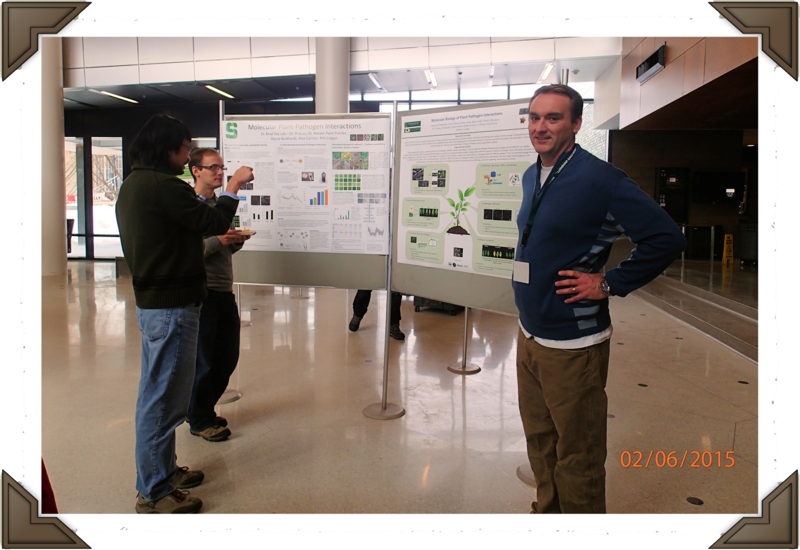 02/06/2015 – PI’s He & Day use lab posters to summarize for new recruits the various research the Labs are involved in. This research produced several posts, gatherings, discussions, and, most recently, an entire Resource page dedicated to “Digital Identity Management.” In fact, a frequently referenced source for our Digital Identity Management material, Kate Meyers Emery, will be joining us on April 21 via Aquos and Zoom from her new Digital Management job in NY to discuss how digital identity management took her from MSU to where she is today. Other events of the spring of 2015 included Dr. Corny Barry, who shared how we can develop our mentoring skills by getting involved in the NSF-funded REU program at MSU, and our first outreach activity participating in the recruitment poster session at Brad Day’s request. 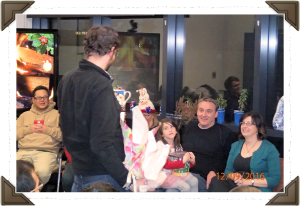 03/13/15 – JP shares to a full house at The Pub Club. 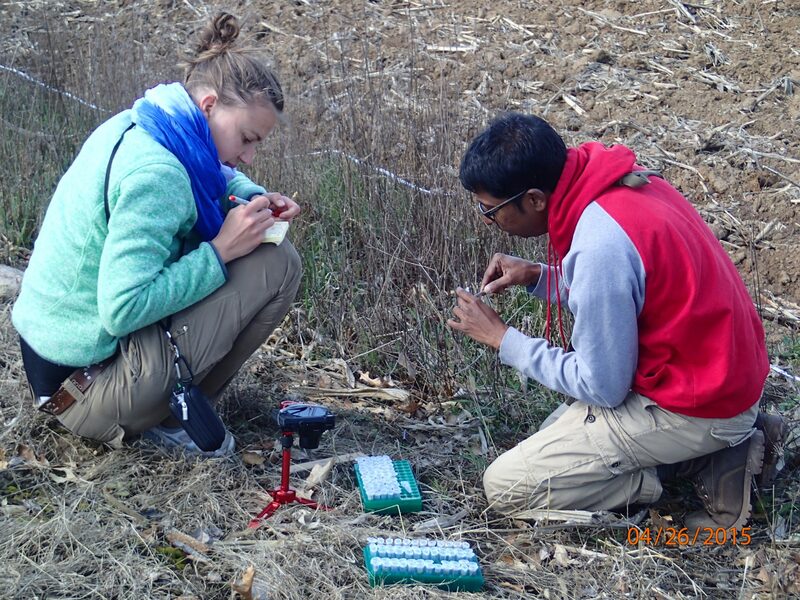 04/26/15 – Jane & Gautam collect Arabidopsis in “the wild” a.k.a. a farm in Jackson, MI. We also experimented with “Pub Day,” which turned out to be a more popular thought than activity and so was discontinued after two events. He lab Alumnus, JP Jerome, returned to a packed house to share his experiences in industry since leaving MSU, and we held our second PI Q&A Day with visiting PI supporters, Dr. Maren Friesen and Dr. Greg Bonito. 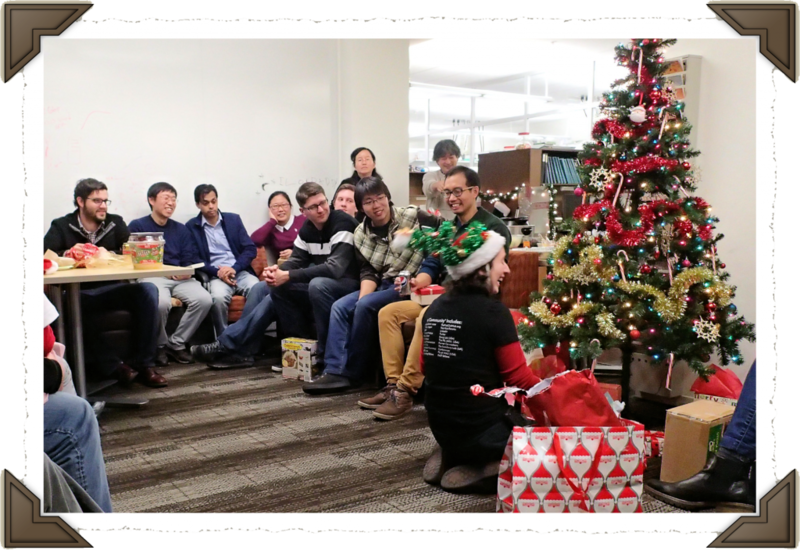 To end the semester, we held an open house for Dr. David Arnosti and members of the Transcriptional Journal Club, and were visited by “The Great Arabidopsis Hunters” from the Weigel lab, Dr. Gautam Shirsekar and Jane Devos. 05/23/15 – The Pub Club’s first Summer BBQ. Before beginning our summer schedule we took an afternoon off for some “Diverse Skill” building… we had our first Summer BBQ with good food, great fun, and special guest, senior scientist at DOW, Dr. Jay Romick. We began the 2015 summer gatherings as we ended the spring – with a visit from “Weigel World” in the form of lab member Emanuele Scacchi. 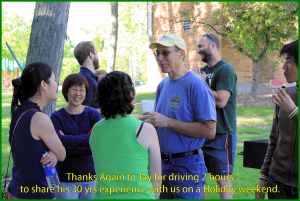 On June 12th we implemented an idea put forward by Sheng Yang He, the 5-minute science update, to help keep us “Meeting on The Edge of Science.” Sheng Yang really hit on something here because today the “5-minute” update can take the first 20 minutes of every Gathering! Over the summer, Brad Day talked to us about “How to be a good reviewer” and Dr. Carl Rhodes, retired science officer from HHMI, joined The Mug Club advising us “to prioritize communication with other scientists and writing.” We wrapped up the summer with Sheng Yang sharing several stories with us he heard at the three conferences he attended over the summer. All in all it was a great summer that dispelled the myth that the summer is lost to everything but the bench. 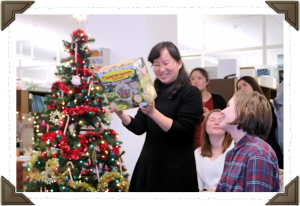 We ended the fall semester with our second annual Christmas Party, but this year we added the “White Elephant” gift exchange, which turned out to be the “ice breaking,” “wall crumbling,” Community Building activity of the semester. 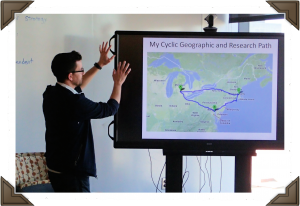 11/20/15 – Rique shares tips and resources for maximizing our competitive edge in the science job market. 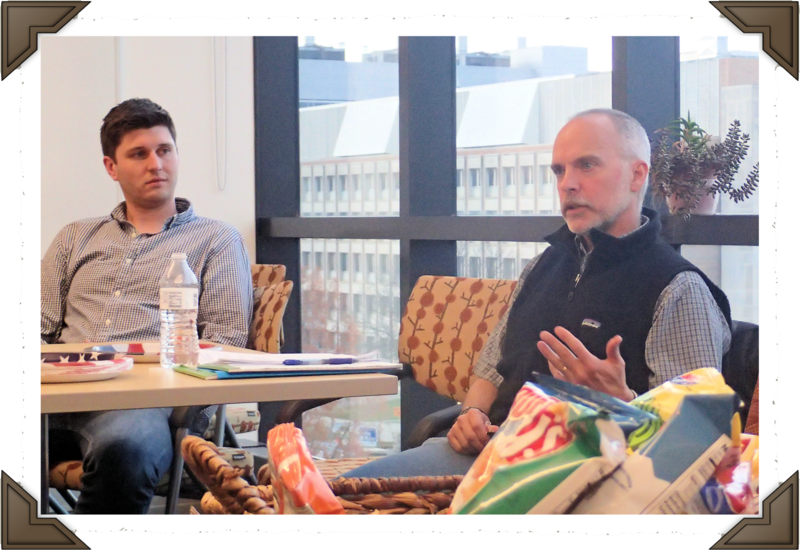 Spring 2016 brought discussions led by Dr. Diane Ebert-May, Dr. Dan Jones, Dr. Robin Buell, Dr. John McDowell and Dr. Ian Baldwin. 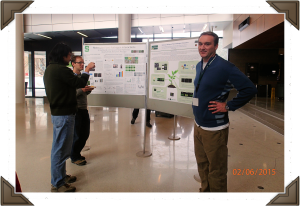 These Mug Club’rs and special guests brought topics from Teaching and Learning to Metabolomics as well as a 30-minute discussion regarding the “best practices” of seed maintenance. We continued to host the floor RCR with a visit to the Zoo… a Nature News Feature article, “Welcome to the CRISPR zoo.” This article provided an amazing list of the many new uses being found for CRISPR, and sparked a lively discussion on both the applications and ethical issues surrounding the ground-breaking technology. Before the spring was over we had tackled sequencing technologies, experimental design for RNA-Seq experiments, and how us “non-bioinformaticians” can better equip ourselves to handle the large data sets we generate. To cap off the spring, the Great Arabidopsis Hunter, Gautam of Weigel World, returned to give us an update on his Arabidopsis Hunting adventures. 05/13/16 – The Pub Club meets Weigel World – Weigel side. 10/14/16 – Sheng Yang takes another look before we begin. This semester at The Pub Club we have been applying a teaching approach called backwards design to help us maximize the time we spend in our Friday Gatherings. In addition to our overall Mission objectives, another objective this semester is “to be able to Identify the Big Idea or Challenge our research addresses and effectively Communicate the Relevance of our work to diverse audiences.” We have pursued this objective aggressively, kicking off the semester with an assessment of the Big Ideas and Key Findings from top papers published in 2016! Bethany and Miranda led another UnderGrad Career Day, Joe returned to practice his interview skills, and Danve presented Figure Design information and The Broad Institute’s CommKit. 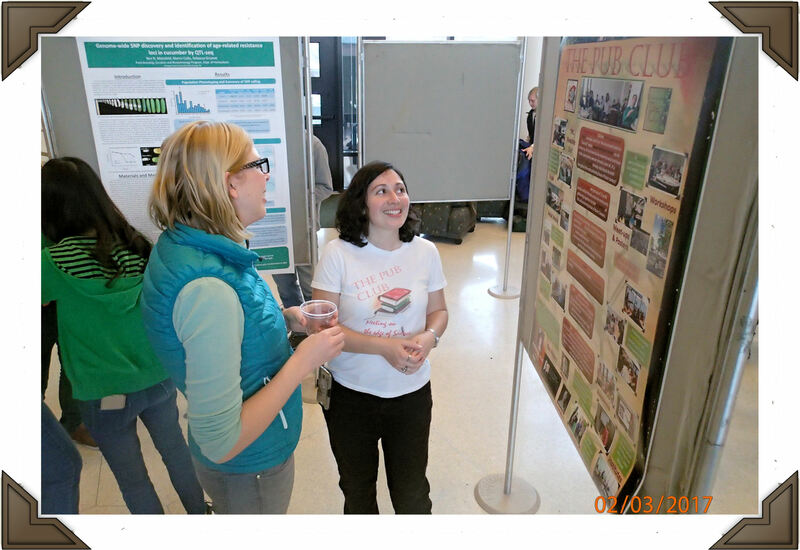 02/03/17 – Bethany explains The COM and The Pub Club to a member of the Shiu lab. 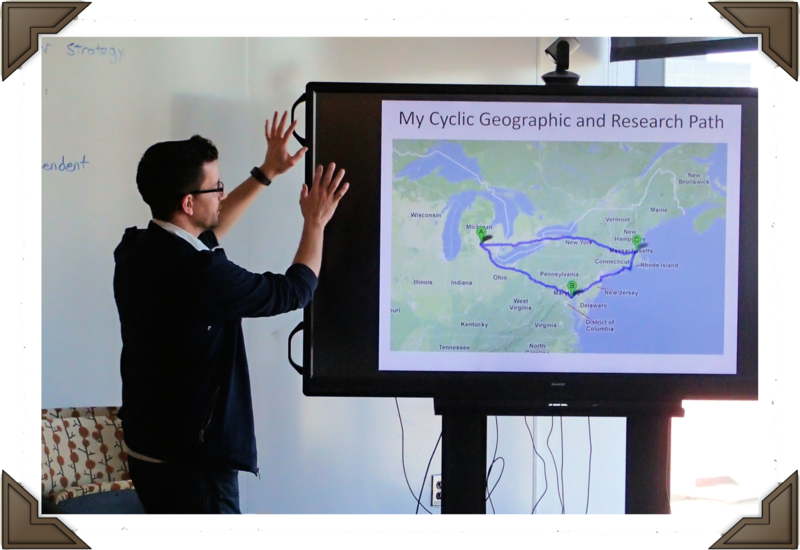 02/17/17 – Danny shows TPC his career path geographic view. TPC Alumna, Cait Thireault, joined us to present her background research for building a career focusing on intellectual property and patent law, and our Mug Club’rs so far have included Dr. Sheril Kirshenbaum, Dr. Danny Ducat, and Dr. Doug Schemske. Sheril used Hershey Kisses and the Telephone Game to talk Science Communication. Danny asked us to “first consider what compels you to do science, and use that as your defining element.” Danny pointed out that in his experience postdocs get trapped by the idea that “one brilliant story and everything will be set,” when the truth is quality communication skills are more useful. Well that’s it! We will finish our objectives of Identifying Big Science and Diverse Skill development with Dr. Robert Geier, who is the Deputy Director of the MSU CREATE for STEM, Kate Meyers Emery, Manager of Digital Identity at the George Eastman Museum in NY, and our spring PI Q&A Day, which will be another addition of The Coaster Club. I guess when all is said and done it would be hard to argue that the first 100 of The Pub Club did not fulfill its Mission, or that it has been anything other than a huge success. So Thanks to the members of The Pub Club COM, and remember “history has shown that science is done best in the context of community.” The Community at The Pub Club is always ready and anxious to be a node in your COM. To see the complete summaries of all The Pub Club Gatherings and special events hover over “The Vault” tab on TheCOMonline.net and enter “The Pub Club Files.” You can navigate to either “Photo Files” or “Summaries & Docs,” which are grouped by semester. Enjoy!